NOTE: Make sure to update your Legacy program by visiting http://www.legacyfamilytree.com/DownloadUpdate.asp. The update is critical, especially if you installed Legacy from a CD. The update fixes an installation problem some users got about a GLBxxx.tmp file and also fixes an error 9 some users had when opening a file from an earlier version. 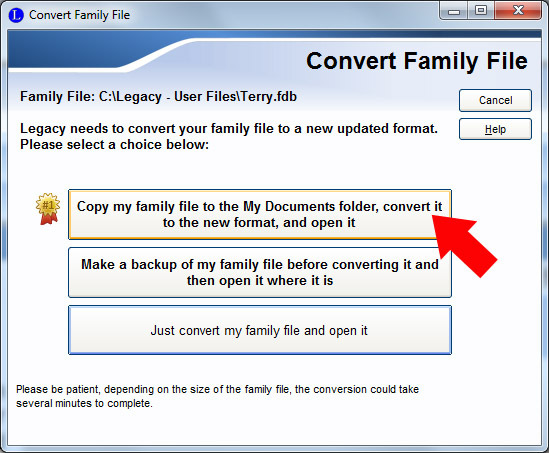 If using a family file from an earlier version, check/repair it in your old program before opening it in the current version of Legacy. Click on File > File Maintenance > Check/Repair and proceed. If any error messages occur, click No to finish the repair steps. (You can also try Yes in some cases.) If there is an ERROR.LOG run check/repair a second time. The goal is no ERROR.LOG. 1. Start Legacy and click on File and select Open File. The Open File windows will open. 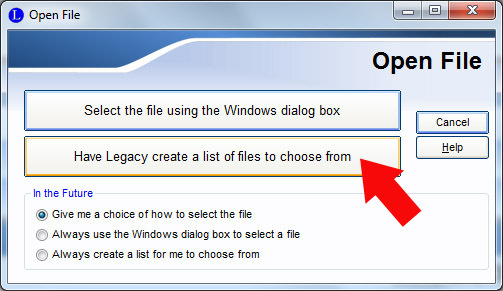 Select the file using the Windows dialog box - This option lets you choose the drive, folder, and file name to open. This is a good choice if you know where your family file is and how to get to it. 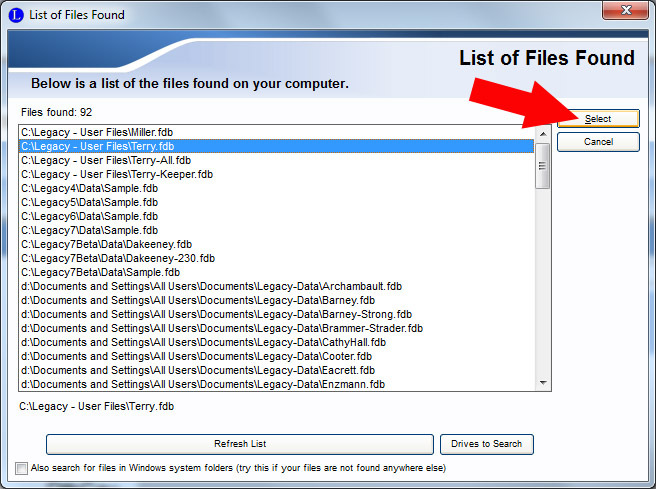 Have Legacy create a list of files to choose from - Select this option to have Legacy collect and display a list of all the appropriate files from all the drives on your computer. This is the best choice if you don't know where or how to find your family file. If you want to always have Legacy use one or the other options, mark your choice in the In the Future box. 3. Highlight your family file and click the Select button. If you have added new family files, deleted family files or renamed family files since the last time you opened this list, click the Refresh List button (if you are not sure, just go ahead and click it). 5. Sometimes, in rare instances, there are problems converting and opening the copy of your family file. If this happens, delete the corrupted file and close Legacy. Next start your old version of Legacy (it should still be on your computer) and open the un-converted family file. Click on File > File Maintenance > Check/Repair. When the file has been repaired, start Legacy and begin with step 1 again. 6. When the conversion is complete, the family file will open. Large family files can take several minutes to convert if a lot of changes are being made. Small files proceed quickly. Your converted family file cannot be opened by previous versions of Legacy. To go back, you will have to open the original, un-converted family file, restore it from your backup copy, or export a GEDCOM file from Legacy and imported into your previous version of Legacy Family Tree.